When I was 13 years old, I remember opening the yellow pages in search of record shops in Salt Lake City … I was one full-length away from completing my Skinny Puppy collection on cassette. Although I ended up finding what I was looking for at The Heavy Metal Shop, one of the first places I called (and subsequently visited) was The Record Collector. Although the only item I purchased there that day was a Beatles poster, The Record Collector and its sense of true independent operation and friendliness has remained a favorite place for me to visit when I’m looking for vinyl. SLUG: How long have you been in business, David? David Hansen: Coming up on 25 years. SLUG: All in the same location? Hansen: Not quite. Roughly 20 years in my current spot, and I spent three years across from the Soup Kitchen up here in Sugarhouse, as well as two years down on the corner of 21st South and 7th East. SLUG: What initially got you interested in opening a business, especially one centered around buying, selling and trading vinyl records? Hansen: I’d always been interested in music; I played in bands and such as a kid. I always wanted to be a musician, but needless to say, it didn’t work out. I had a brother-in-law at the time who had an amazing record collection, probably around 3,000 pieces, and that got me really interested in amassing a collection strictly for the purpose of collecting. A little while down the road, I began to realize that the obvious next step for me was to open a record shop of my own. SLUG: How do you see yourself and The Record Collector continuing to exist here in Sugarhouse with all the changes currently taking place? Your shop is essentially the last of the local-owned businesses still up-and-running among the proverbial chaos. Hansen: That’s a good question. I was kind of the first here, and I’ll probably be the last. If I can get another five years here, I would be happy. I mean, what’s happening in Sugarhouse right now didn’t do me any good … I don’t think it did anyone any good. It really hurt a lot of the little locally owned businesses. It’s a drag. I, however, haven’t had any pressure to close or move. The people that own my building own the entire block, and they’ve had some people express some interest, but no one’s come along with the money to make anything happen. Of course, it could eventually happen and take me somewhat by surprise. I’ve been thinking about that since the Sugarhouse Commons went up. SLUG: How does what’s going on currently affect you personally? Essentially, the entire face of Sugarhouse is changing, and a lot of us who grew up in this area and frequented the businesses here aren’t too thrilled about it. Do you feel the same way? Hansen: I’ve tried not to let it bother me too much. All in all, it’s another one of those sad things when big business comes along and “ends an era,” so to speak. I think if I were 10 or 15 years younger, it would be much more difficult for me. I tend to be practical about things, though. I try not to take what’s going on here too personally, but that doesn’t mean I like it. As I said, I’m coming to the end of my business career pretty quickly, but I could also see the shop staying open for another 20 years with someone younger running it. SLUG: So, if the current owners decide not to sell the land or the building you occupy, you wouldn’t mind allowing someone else to take over the business, essentially? Hansen: Well, all in all, I should not be here in business in the first place ... If I knew how I managed to stay here, I would sell the ideas and information for a million dollars, you know? Firstly, I don’t pay a lot of money for rent here. The people I rent from are from a much older school than most landowners today, and they’re not greedy people. This whole block was paid off years ago, and the landowners know all the business owners that rent from them personally. They’re very good people. SLUG: Do you live in Sugarhouse, then? Hansen: I am the MAYOR of Sugarhouse ... self-appointedly, of course. I’m a legend in my own mind, so to speak. I’ve been a big part of Sugarhouse for 25 years, as I’ve said ... almost two decades in the same place. I’ve had people who started coming here when they were in high school; now they bring their kids in here. That’s something I’m pretty proud of. Maybe it means more to other people than it does to me, though. I didn’t grow up in Sugarhouse, but I remember spending a lot of time here as a kid. In the 1950s, Sugarhouse was what was “happening” in the city apart from everything downtown, much the same way it was what was “happening” until the current changes. SLUG: Let’s change course a bit here. Who are some of your favorite bands? SLUG: How has having so many favorite artists affected your owning a music store? Hansen: Well, I’ve listened to a lot of music, probably more music than most people will listen to in their entire lives. But when I go home, I don’t like to listen to music. I keep that pretty much at the store, and I listen to a lot of different stuff here. I was listening to sitar music in here earlier today—Ravi Shankar, you know? But because I tend to listen to music mainly in the store, it’s actually had a positive effect because I’ve become exposed to so many different artists and types of music during this whole ride, and I consider myself to be extremely fortunate because of that. SLUG: So, you pretty much have the coolest job in the world, right? Hansen: Absolutely. 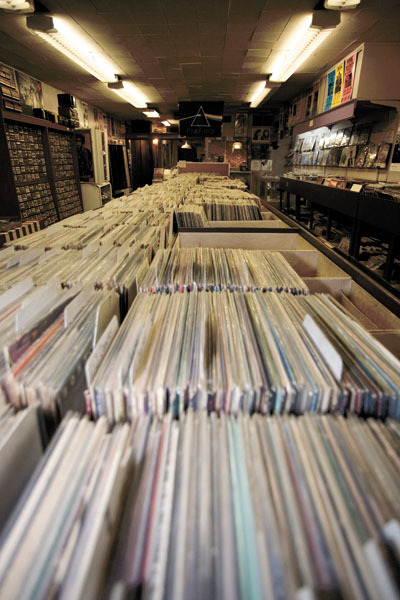 You can visit The Record Collector at 1115 E. 2100 South in Sugarhouse.